The eSR2F 110 is one of the latest innovations in the Hybrid Converting field offered by Enprom; which combines inline processes to offer the best solution. 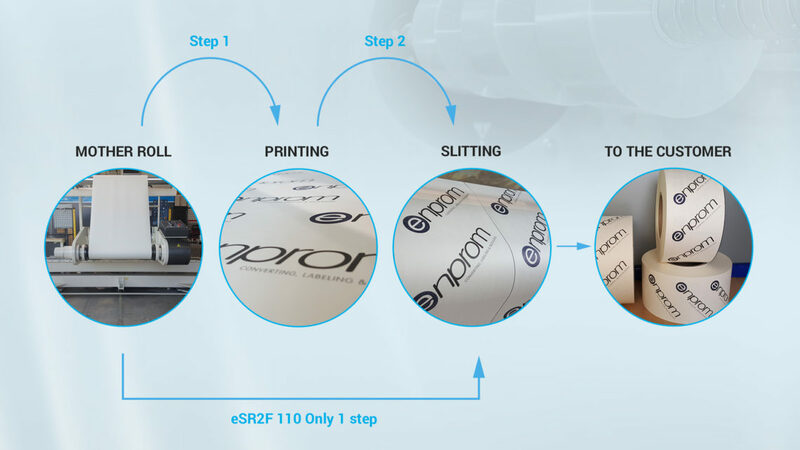 This is obtained by integrating the two conventional independent processes of printing and cutting in a single line to be able to make the final product in a single step. The result of this merger generates competitive advantages to the customer such as: waste reduction, minimum electricity consumption, fewer operators, optimization of the production area, and ease of production control; thus obtaining a customized machine, highly productive and innovative in the market, providing added value and differentiated. • A regenerative motorized unwinder, which reuses the energy created to feed the other motors. • Perfect high sensitivity tension control by pneumatic dancer roller. • Threading the material by chain. • Two groups of flexographic printing Gearless, CNC. • High performance drying unit with recirculation. • Circular cutting system with printed line inspection. • Assistant for reel discharges with gravitational equipment for extraction of the rewinder shaft. • Regenerative high-performance control equipment. It includes 4.0 technologies. • Intuitive software that is easy to use and controls productivity. Two new Bandera Geo FutureFilm lines in the U.S.A.